Piggybank.ng platform was started by the trios: Odunayo Eweniyi, Somto Ifezue and Joshua Chibueze, all former students of Covenant University, Nigeria, with the aim of solving the endemic problem of lack of savings across the country. According to statistics, about 80% of Nigerians are required to save at least 40% of their monthly earnings to be able to survive the hard times. And especially in our society, where there is no credit system, people tend to depend on the accumulated savings to make any headway in business startup, and the majority of payments are made in cash. The Piggybank concept is pretty straightforward and simple; just deposit as little as $1 a day in your online Piggybank.ng account, which you can not touch until an agreed withdrawal date, except perhaps for an emergency, albeit you are required to pay a 5% early withdrawal fee. Whilst the accumulated savings are entitled to around 6% interest per annum, you can always set an agreed withdrawal date, unless perhaps you are okay with 5% early withdrawal charges. Unlike conventional banking system, the platform restricts withdrawals until an agreed date or users can set to withdraw their savings on a quarterly basis. The idea of a fee is actually to discourage unnecessary withdrawals, which in itself will defeat the real purpose of the platform - to help users save up some tangible amount of funds - instead of ending up using all income in servicing some unforeseen expenses. It is particularly targeted at Nigeria’s Millennials, whom online activities via mobile phones for day-to-day communications and transactions are becoming hugely popular, and currently these demography make up about 60% of its registered users. 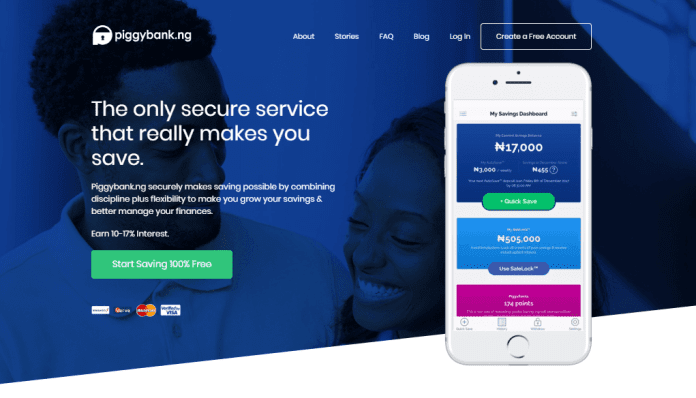 Piggybank.ng recorded some staggering growth in savings of 3000% between 2016-17, with savings amounting to over $5M, which statistics drew the attention of a group of investors, led by Olumide Soyombo, Co-Founder of Leadpath, who have been instrumental in the raising of $1.1M by the company. To get started is as easy as signing up via PiggyBank.ng portal, and there’s a Quick Save option that allows you to quickly save money at hand. Both Quick Save and Auto Save can work at the same time. You can add funds to your PiggyBank.ng account by choosing from the different payment options, including: debit cards (VISA, MASTERCARD, etc), or other means that are available on the dashboard. Additionally, there is PiggFlex Account which is different from the Core Savings account, that gets you rewarded with points which can be converted to cash from your use of the PiggyBank.ng app, and also offer upfront interest for using the SafeLock feature within the PiggyBank app. Piggybank has rebranded to PiggyVest, more information will be available in the following weeks!